Happy December and Merry Christmas a little early! Here's my December Bulletin Board Decoration for church. This one is probably my all-time favorite one, and all because I FINALLY learned how to do the wreath with my Martha Stewart branch punch! Click here if your interested in a tutorial on making the wreath. I used nearly a whole sheet on that wreath since I wanted it very full and pretty! 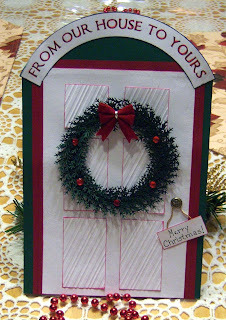 Come back tomorrow to see some wreath cards I've been working on! I'm thinking of doing something very similar, only in card form, to go with the house boxes I made for our board members for Christmas. Thanks for the idea!